Subtle contrast in the sandwich peak sets this cap apart from a crowd. 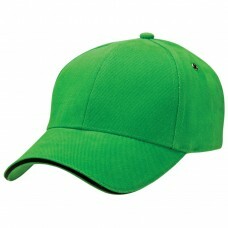 Pink Rhino Promotional Merchandise Headwear is an excellent way to get your brand out amongst the crowd. They act as a gift to prospective customers or as a form of organisation attire. Promotional Headwear combines utility with high visible branding. Whether as a fashion item or protective branded promotional headwear it is an accessory your employees and clients will both appreciate. They are practical and inexpensive. A one size fits most allows you to stock up and hand them out when required.